Spitfire's claim that this is the only percussion library you'll need isn't as far-fetched as it sounds. Wonderful array of percussion sounds. Tailor-make the 'space' you need with Close, Tree and Ambient microphone sources. Readily playable, with key switching, mod wheel control over dynamics and more. Percussion Redux represents the second incarnation of Spitfire Audio's percussion library and, featuring the comprehensive playing talents of Joby Burgess and having been recorded in Air Lyndhurst, a popular sound-stage for TV and film projects, it's built on hugely promising foundations. The ready playability is apparent 'from the off'. For all patches, at least a single articulation is pre-loaded as you click an instrument type, while for those featuring rolls, accented hits or alternative articulations, the RAM footprint can be expanded as you click to add these, or purged as they're deselected. By default, articulations are selected by key switches 'outside' the pitch range of the instruments in question, while the modulation wheel is used to control dynamics, making snare rolls, for example, a joy to create. "The Celeste is a real treat, as it's the actual instrument used on the Harry Potter soundtracks; we defy you not to reach for John Williams' notes when you load it. " Percussion Redux is so comprehensively stocked with sounds, it would be easy to spend our entire word limit simply listing instruments with their articulations. Sounds are organised into Drums (separate folders for High and Low), Mallets (Metal and Wood), Timpani, Toys and Unpitched (Metal and Wood) folders, so navigation is simple. Inside Mallets Wood, you'll find the best sounding sampled Marimba we've ever heard alongside a similarly excellent Xylophone. Sticking with pitched instruments, the Celeste is a real treat, as it's the actual instrument used on the Harry Potter soundtracks; we defy you not to reach for John Williams' notes when you load it. The Celeste is joined by similarly delicate Crotales, Glockenspiel and Vibraphone sounds, while a wonderfully resonant Tubular Bells patch also encourages pastiche performances. "If you prefer your percussion on the more bombastic side, you won't be disappointed"
If you prefer your percussion on the more bombastic side, you won't be disappointed. 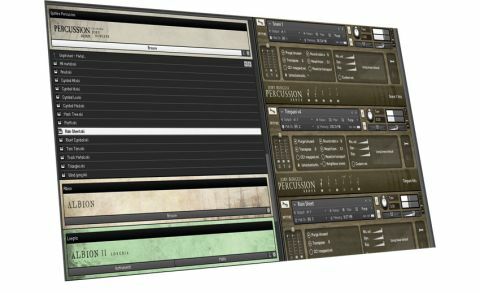 The Timpani folder contains a single patch but within this you'll find six articulations taking you from single hits through rolls, to swells and combined patches of hits and rolls together. The heavier drums give you a fantastic sense of just how much a part 'space' plays in accurate sampled orchestral scoring, as the difference between the Close, Tree and Ambient microphones is huge here. The benefits of being able to blend all three really comes into its own with the Timpani, as it also does for the Snares, Bass Drums and impressive array of Toms, with 'regular' orchestral toms enhanced by a collection of higher-pitched Rototoms. Last but by no means least, a veritable bag of tricks is opened up within the Toys folder, where you'll find Agogos, Cabasas and Shakers alongside Ratchets, Gankogui and Jawbone sounds. All Toys gives you all of the above in a single collection, which is huge fun. All in all, a wonderful array of carefully sampled and organised sounds. Phenomenal.